Network Time Protocol (NTP) is a networking protocol for clock synchronization between computer systems over networks. For highly time-sensitive applications (such as those in the communication industry), clock variation between different computers may lead to serious data inconsistencies. You can use the NTP service to synchronize clocks of all servers within the network. The current default time zone for Alibaba Cloud ECS instances across all regions is CST (China Standard Time). 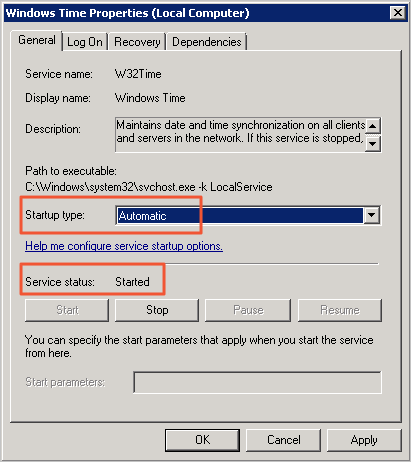 This article describes how use the NTP service to synchronize the clock of a Windows ECS instance running Windows Server 2008 R2 Enterprise Edition x64. Connect to a Windows instance. Select Start > All Programs > Accessories > Run to open the Run dialog box, and run services.msc. In the Services window, double click the Windows Time service. Check if the Service status is Started. If not, click Start. After completing the settings, click Apply, and then click OK. In the notification area of the task bar, click Date and Time, and then click Change date and time settings. In the Date and Time dialog box, click the Internet Time tab, and then click Change settings. In the Internet Time Settings dialog box, select Synchronize with an Internet time server, type an Alibaba Cloud intranet NTP server address (for detailed list, see Internet and intranet NTP servers), and then click Update now. You are prompted if the synchronization is successful. Select Start > All Programs > Accessories > Run to open the Run dialog box, and run regedit. On the left-side navigation pane of the Registry Editor, find HKEY_LOCAL_MACHINE/SYSTEM/CurrentControlSet/services/W32Time/TimeProviders/NtpClient, and then double click SpecialPollInterval. In the Edit DWORD (32-bit) Value dialog box, select Decimal as the Base, and then type the Value data as needed. The number you typed is the synchronization interval you need. Unit: seconds.